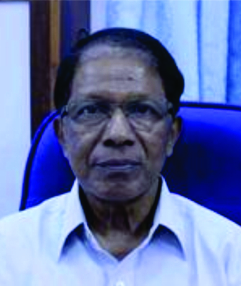 Senior Consultant and Head,Orthopedic Surgeon at SUT Hospital, Pattom,Trivandrum,Kerala, India. Cancer grows locally in a centrifugal manner and reaches distal sites via lymphatic and vascular pathways. It is unclear what provisions in the tumour prompt the migration pathway. In depth knowledge of human anatomy extrapolated with Common sense, guide and prompt us to think of the “Natural barriers” in the centrifugal spread of tumours. Certain tissues in the limbs, such as articular cartilage ,synovium and capsule, thick cortical bone and periosteum, major fascias septae, tendon origin and insertion of muscles and in childhood thick physeal cartilage act as natural barriers. These structures, by virtue of their unique anatomy, act as “NATURAL BARRIERS” to tumour spread and separate tissues into distinct anatomical spaces called compartments. Keywords: Bone sarcoma, paediatric tumors, natural barriers. Humans in their pursuit of achieving self-sufficiency in life, have conquered many mountains of success, many yet to climb. We, health professionals, have shared these success stories in understanding the causes and the right remedial means in many diseases humans suffer. At least a few of us might feel strange when we come to realise that cancer begins in one’s own cell; bone cancer for that matter is no exception. When sarcoma and cancer spread from its site of origin to the lungs, liver kidney, brain or cardiovascular system, the life ends, all on a sudden or insidiously. A clear knowledge of tissues and structures which are normally present in our body and are recruited to perform the additional function of containing the noxious agent, like a sarcoma, from spreading is essential for any clinician dealing with bone tumors. In a global perceptive this is similar to the sea, mountains and rivers being used as territorial barriers of nations. e) Projecting the prognosis of a sarcoma. Athorough knowledge of the anatomical spaces (compartments) into which malignant tumours extend from their site of origin is essential to stage the tumour and plan the steps of local surgical treatment. In this context what commonly referred as “Natural barriers “is relevant in the evaluation neoplastic growths, malignant tumours in particular. The primary goal of an oncologic surgeon is to provide local control of disease by obtaining adequate tumour margin at the time of resection. Today local disease control, where ever possible is achieved through a limb-sparing procedure, however, if the lesion is too advanced, an amputation or even disarticulation will be required for disease control. The decision to amputate or perform a limb sparing procedure depends on many factors. These include ,size of tumour, the relationship of tumour to adjacent structures such as nerves, blood vessels, involvement of adjacent joint and the overall stage of the tumour at presentation. Although different staging systems now exist, it can be seen that they are all based on three common components; namely the grade of the tumour, its local extent and the presence of metastasis. The system of Enneking staging (1, 2 3) which has been adopted by MSTS is shown in table 1. The grade of the tumour is a measure of its ability to metastasise. It is based on primarily on histologic features such as cellular atypia, number of mitoses, degree of necrosis and vascularity. A sarcoma is classified as either low- grade or high- grade. In general a low- grade lesion is less biologically active and will require a relatively conservative surgical procedure, conversely a high grade lesion will usually require a more radical procedure because of its more aggressive nature. Factors related to the tumour site include the size of the lesion and its local extent. Sarcomas tend to grow centrifugal lay along pathways of least resistance and are contained in part by a pseudo capsule as they extend into adjacent tissues. Encapsulation is a reflexion of host response. In biologically active and in malignant tumours encapsulation is incomplete. A malignant lesion may remain contained within the pseudo capsule (intra-capsular) but in general malignant cells often extend beyond the capsular boundaries (skip lesions). If a lesion extends through its capsule but is still confined within a single anatomical compartment, it is considered extra-capsular but intra-compartental. If the tumour extend into an adjacent compartment it is classified as extra-compartmental. In general lesions with more advanced local extension including involvement of neurovascular structures or joint, require excision of more adjacent tissue than do smaller tumors that have not spread to local soft tissues. At time of diagnosis most bone sarcomas would have breached the bony cortex and spread to local soft tissue, making them bicompartmental. This may be specifically correct in our country where there is always a delay in diagnosis due to ignorance on part of patient or multiple consultations that are sought by the patients. The third component of the staging system is the presence of lymph nodal or distant metastasis. Regional lymph node involvement is much less common with musculoskeletal sarcomas than are pulmonary metastasis, but both are equally poor prognostic factors. Certain tissues in the limbs, such as articular cartilage, synovium and capsule, cortical bone and periosteum , major fascia’s septate, tendon origin and insertion of muscles, in childhood the wide physical cartilage, act as ” natural barriers” to tumour spread and separate tissues into distinct Anatomic Spaces called compartments .Among the natural barriers mentioned above, the physeal cartilage deserves special mention. 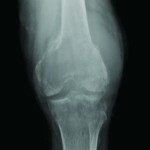 In the pre-adolescent age the physeal cartilage in the lower femur and upper tibia is very wide. Between its second and third layers of the physeal cartilage (Fig. 1) there are no constant blood vessel demonstrated, also except at the subperiosteally region, no constant anastomoses between epiphyseal and metaphyseal vessels. This variation in blood supply of the physeal cartilage has a bearing on the spread of tumours in the metaphyseal region. Therefore a malignant lesion confined to the metaphyseal side of the physeal cartilage can be considered for radical removal through the second and third layer as extracompartmental resection. On a personal experience ,Intercalary resection for osteosarcoma with over twenty five years of follow up have confirmed wide physeal cartilage in the lower femur and upper tibia is a predictable natural barrier (Fig. 2 ). The greatest advantage of this type of resection is, it is radical, and ECRT of resected bone and reconstruction with the same bone becomes anatomical. If goes uncomplicated the reconstruction becomes biological, function will be excellent and cosmetically normal and lifelong. A tumour confined to one of these spaces is considered intra-compartental and is of a lower stage than a lesion that has spread beyond these barriers classified as extra- compartmental. This extra-compartmental spread may occur via direct tumour invasion of an adjacent space or by contamination resulting from fracture (Fig. 3) haemorrhage or an operative procedure such as an unplanned resection or an inadvertently planned biopsy. An extra- compartmental lesion will require a more radical resection than one that is purely intra-compartmental. Fat areoles tissue and muscle are relatively poor natural barriers to spread of tumours and certain regions in the body that are composed of these tissues are considered completely extra compartmental. A tumour involving any of these regions whether it arose there or involved from adjacent compartments is considered extra- compartmental. An update on the anatomic spaces (compartments) of the extremity is briefly described. Without that a presentation on natural barriers of malignant tumour spread would be incomplete. The skin and subcutaneous fat together are considered a single compartment. They are separated from deeper tissues by a thick fascia, deep fascia,. There are no barrier for longitudinal spread of tumour in this compartment. Each bone is considered an individual compartment bounded by the cortex and periosteum and the articular cartilage at the ends. A purely intraosseous lesion is therefore considered intracompartmental (Fig. 4), whereas tumour extending from bone to adjacent soft tissue (Fig. 5) or vice versa would be considered extra-compartmental. Except at the site of attachment of muscles there is a narrow space occupied by areolar tissue around large bones like humerus, femur and tibia. This space between the bone and overlying tissue is considered a compartment because a lesion could arise in that location without invading bone or adjacent soft tissues. Each joint is considered a distinct compartment bounded by synovial and capsular tissues. Neurovascular structures are not classically considered compartments but must be evaluated during staging or biopsy of sarcoma. Tumour spread usually occur between compartments along neurovascular bundles and involvement of major nerves may preclude the possibility of limb sparing procedure. Periscapular: – The muscles and fasciae covering the dorsal scapula are considered a compartment. They include the infraspinatus, trees minor and rhomboid muscles. The supraspinatus muscle is in a separate compartment, as the spine of the scapula separate these two regions. Upper arm: – The soft tissues of the upper arm are divided into two compartments: anterior and posterior (Fig. 6) the anterior compartment contains the biceps, brachialis, coracobrachialis and brachioradialis muscle. The triceps musculature comprises the posterior compartment. Forearm: – The forearm contains two compartments: dorsal and volar (Fig. 6).The extensor muscles in the dorsal compartment; it is separated from the volar compartment by the interosseous membrane. The flexor muscles are found in the volar compartment. Hand: – The palmar soft tissues are separated into multiple compartments but because they are so compact and have so many neurovascular communications, most lesions involving this region are considered extra-compartmental. Extra-compartmental spaces of the upper extremity: – Purely extra-compartmental spaces of the upper extremity include the periclavicular region, axilla, antecubital fossa, wrist and the dorsum of the hand. A lesion confined to a single bone or muscle within the pelvis would be considered intra-compartmental, but most lesions are large at presentation and show extra-compartmental spread to adjacent tissues by the time the patient is examined. Thigh :- Three compartments make up the thigh anterior, posterior and medial(Fig. 7) The anterior compartment contains the iliotibial tract and tensor muscle of the fascia lata and the quadriceps musculature (rectus femoris, vastus medialis, vastus lateralis, vastus intermedius) the vastus intermidius muscle is sometimes considered a separate , fourth compartment. The posterior compartment contains the hamstring muscles (semimembranosus, semitendinosus and biceps femoris) as well as sciatic nerve. The gracilis and adductor muscles lie within the medial compartment. Although the sartorius muscle is an anterior structure proximally and a medial structure in the distal thigh, it is classically considered an anterior compartment structure. Lower leg: – The lower leg is divided into four compartments. Anterior, deep posterior, superficial posterior, and lateral (Fig. 8). The anterior compartment contains the tibialis anterior, extensor digitorum long is, and extensor hallusis logus muscles as well as the anterior tibial vessels and deep peroneal nerve. The anterior compartment is separated from the deep posterior compartment by the interosseous membrane. The tibialis posterior, flexor digitorum, flexor hallucis longus muscles lie in the deep posterior compartment along with the posterior tibial and peroneal arteries and the posterior tibial nerve. The superficial posterior compartment contains the gastrocnemius and soleus muscles and the sural nerve. The peroneal muscles lie in the lateral compartment along with common and superficial peroneal nerves. Foot: – The plantar tissues of the foot are divided into three compartments: medial central and lateral. The medial compartment contains the abductor hallucis and flexor hallucis brevis muscles. The flexor digitorum brevis, quadratus plantae, lumbricals and adductor hallucis muscles lie in the central compartment. The lateral compartment contains the abductor and short flexor muscles. Extra-compartmental spaces in the lower extremity. The groin (inguinal region and femoral triangle) popliteal fossa ankle and dorsum of foot are considered extra-compartmental. Choose the shortest route from skin and the lesion. Avoid neurovascular and joint, lung, bowel, and other organs. In suspected malignant lesions the needle path to be in the line of incision for resection. The needle should not traverse an uninvolved compartment. 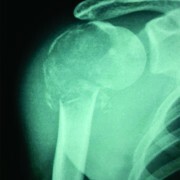 Osseous tumours, like Osteosarcoma, most commonly affect the proximal humerus, pelvis, distal femur and proximal tibia. Safe Per cutaneous biopsy approach is described below. The pre-treatment work up in a suspected musculoskeletal sarcoma should include plain radiograph, ultra sound scan, CT scan of local and chest, pre and post chemotherapy MRI of lesion, bone scan and in selected patients PET scan(4, 5). Lesions in this region should be biopsied using an anterior approach through the anterior third of the deltoid muscle. The deltoid muscle is innervated by the axillary nerve from posterior to anterior. If needle track is chosen anywhere in the posterior two thirds of the muscle, the residual anterior portion will be essentially denervated and functionless after resection of the posterior portion of the muscle. A needle path through the gluteal muscles should be avoided for lesions in the pelvis because resection of these muscles during a limb sparing procedure will result in poor functional outcome. An anterior approach preferably through the anterior superior iliac spine or anterior inferior iliac spines spines should be used wherever possible. The posterior superior iliac spine is an alternative route. An anterior approach through the rectus femoris or quadriceps tendon should be avoided. If the quadriceps tendon must be resected as part of a limb sparing procedure because the biopsy passed through it, the functional result is suboptimal. A medial or lateral needle path can be used for lesions in this region, though a medial surgical approach affords optimal access to the neurovascular structures during resection. An anteromedial approach should be used for tumours in the proximal tibia because it will avoid contaminating adjacent compartments. For an orthoapedic oncology surgeon there is always a tussle between removing all the affected tissue while preserving all normal tissue. For this reason anatomical landmarks and detailed knowledge of compartments is much more important to an orthopaedic oncology surgeon. Again the same knowledge will be needed by faculties of interventional radiology and pathologist too. In this review, I have tried to cover the most important clinical principles along with anatomical details of common sites. however this review is by no means exhaustive and a more detailed knowledge should be acquired from other sources and articles. Anatomical boundaries play crucial role in limiting spread of sarcomas. A thorough knowledge of the anatomical spaces (compartments) which are bounded by natural barriers is essential for staging of tumours. The management plan will alters depending on the integrity of these natural barriers. This knowledge is also essential in performing per cutaneous needle biopsy and limb sparing resection procedures. 1 . Enneking WF, Spanier SS, Goodman MA. 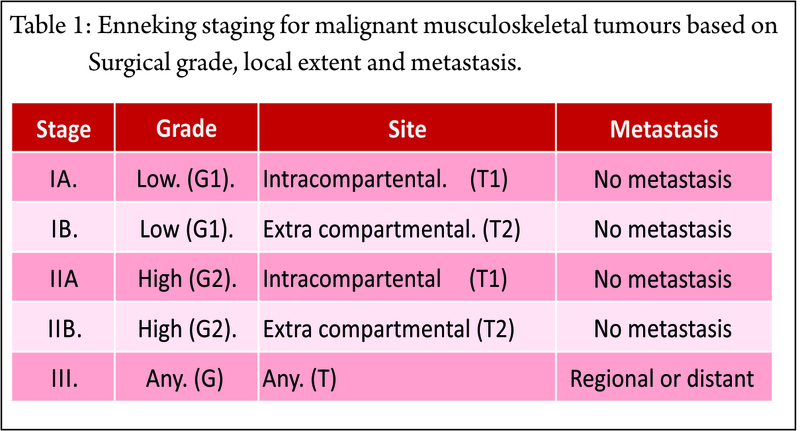 A system for the surgical staging of Musculoskeletal sarcoma. Clin. Orthop Relat Res 1980; 153; 106-120. 2. Enneking WF, Spannier SS, Goodman MA. A System for the surgical staging of Musculoskeletal sarcoma, 1980 Clin Orthop Relat Res, 2003; 415:4-18. 3. M.U .Jawad, S.P.Scully: Enneking Classification: Benign and Malignant Tumours Of the Musculoskeletal System. Clin Orthop Relat Res 2010’468:2000-2002. 4. Olson PN, Everson Ll Griffiths Hj, staging of musculoskeletal tumours. Radiological Clin North Americaa1994’32 ,151-162. 5. Sundaram M, Mc Guire MH, Herbold DR, Wolverson MK,Heiberg E: Magnetic resonance imaging in planning Limb Salvage Surgery for primary malignant tumours of bone. JBJS A ,1986 ,68A,809-819. How to Cite this article: K C Gopalakrishnan. Natural “Barriers” Its Relevance To The Spread Of Bone Sarcoma. Journal of Bone and Soft Tissue Tumors Sep-Dec 2015;1(2): 5-9. Journal of Bone and Soft Tissue Tumos by http://jbstjournal.com/ is licensed under a Creative Commons Attribution-NonCommercial 4.0 International License. Based on a work at http://jbstjournal.com/.